This study investigated trends in 35 years (1979–2013) temperature (maximum, Tmax and minimum, Tmin) and rainfall at annual and seasonal (pre-monsoon, monsoon, post-monsoon, and winter) scales for 31 grid points in a coastal arid region of India. Box-whisker plots of annual temperature and rainfall time series depict systematic spatial gradients. Trends were examined by applying eight tests, such as Kendall rank correlation (KRC), Spearman rank order correlation (SROC), Mann-Kendall (MK), four modified MK tests, and innovative trend analysis (ITA). Trend magnitudes were quantified by Sen’s slope estimator, and a new method was adopted to assess the significance of linear trends in MK-test statistics. It was found that the significant serial correlation is prominent in the annual and post-monsoon Tmax and Tmin, and pre-monsoon Tmin. The KRC and MK tests yielded similar results in close resemblance with the SROC test. The performance of two modified MK tests considering variance-correction approaches was found superior to the KRC, MK, modified MK with pre-whitening, and ITA tests. The performance of original MK test is poor due to the presence of serial correlation, whereas the ITA method is over-sensitive in identifying trends. Significantly increasing trends are more prominent in Tmin than Tmax. Further, both the annual and monsoon rainfall time series have a significantly increasing trend of 9 mm year−1. The sequential significance of linear trend in MK test-statistics is very strong (R2 ≥ 0.90) in the annual and pre-monsoon Tmin (90% grid points), and strong (R2 ≥ 0.75) in monsoon Tmax (68% grid points), monsoon, post-monsoon, and winter Tmin (respectively 65, 55, and 48% grid points), as well as in the annual and monsoon rainfalls (respectively 68 and 61% grid points). Finally, this study recommends use of variance-corrected MK test for the precise identification of trends. It is emphasized that the rising Tmax may hamper crop growth due to enhanced metabolic-activities and shortened crop-duration. Likewise, increased Tmin may result in lesser crop and biomass yields owing to the increased respiration. The authors are grateful to the reviewers for their useful comments that helped in improving the earlier version of this article. Asfaw A, Simane B, Hassen A, Bantidar A (2017) Variability and time series trend analysis of rainfall and temperature in northcentral Ethiopia: A case study in Woleka sub-basin. 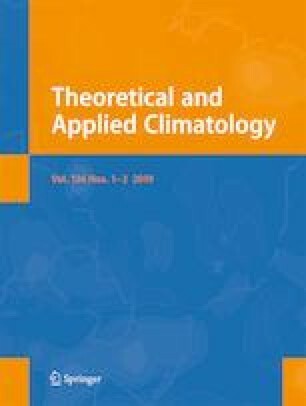 Weather and Climate Extremes, https://doi.org/10.1016/j.wace.2017.12.002. CDIAC (2013) Ranking of the world's countries by 2013 total CO2 emissions from fossil-fuel burning, cement production, and gas flaring. Carbon Dioxide Information Analysis Center (CDIAC), The United States Department of Energy, US. http://cdiac.ornl.gov/trends/emis/top2013.tot. Accessed 23–02-2017.